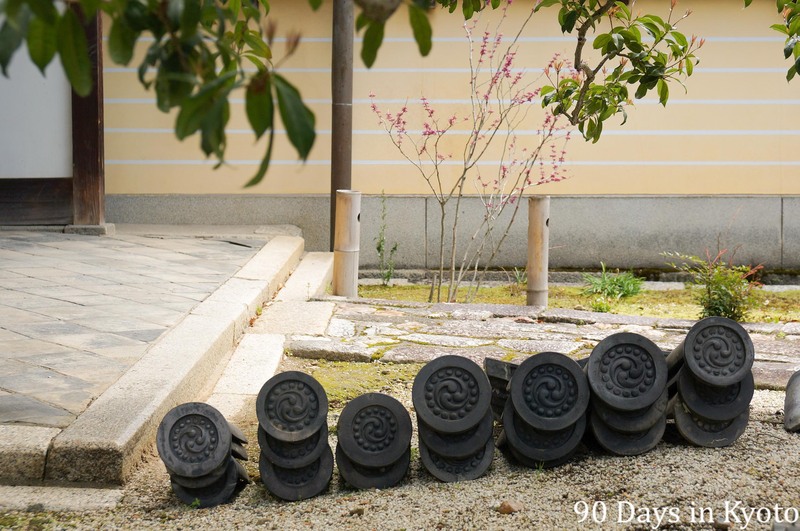 When I left the temple, I saw a lot of Japanese roof tiles (kawara 瓦), ornamental end pieces and ogre tiles called onigawara (鬼瓦) arranged on the ground under a tree. The temple just underwent major restoration work and the tiles were probably stored/exhibited there. The first thing that caught my eye was a row of neatly arranged roof end tiles with a typical Japanese ornament. These symbols are called Kamon (家紋) – emblems used by a family, a temple or an individual, much like a family crest in the western world. This one is made up of three comma shapes that move clockwise to form a circle. It is called Mitsu-domoe (三つ巴) or tokeimawari mitsu domoe (時計回り三つ巴). I am sure they were arranged to resemble a group of seven Jizo statues, which can also be found around temples, shrines and on the roadside and along hiking paths. They are the guardians of young children and travellers. Read more about Jizo or, politely, O-Jizo-Sama in this wikipedia article. 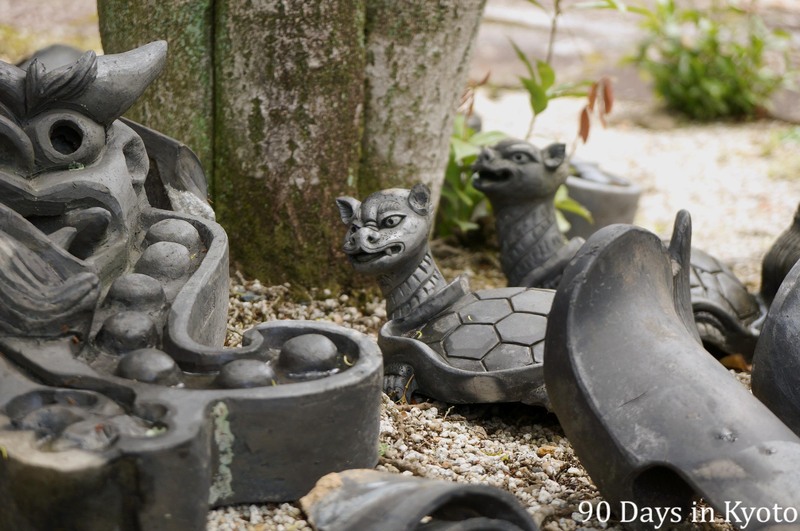 These seven roof tile end pieces are arranged to look like Jizo (地蔵) figures or tiny stone Buddha statues. After I began to take pictures of the tiles, I discovered this fantastic creature: A turtle with what looked like the head of a cat or dragon and a long hairy tail. I researched the subject with the most absurd google search terms until I found out that we are talking about a bushy-tail turtle or Minogame (蓑亀 – literally “straw raincoat turtle”). Bushy-tail turtles are so old, seaweed has started to grow on their shell like hair, making them look bushy-tailed. Turtles are auspicious and often depicted alongside cranes (tsuru) or carps (koi). They are said to get 10,000 years old and are therefore a symbol for good luck, longevity and felicity. They visit and support people who they deem virtuous and compassionate. A grim looking bushy-tail turtle (蓑亀 minogame) with the face of a dragon is an auspicious symbol of longevity. A Japanese friend of mine told that one day, when she was a little girl, a giant turtle visited her in the garden near their house door. Her mom wanted to keep the turtle, since it is a bringer of good luck. Somehow the turtle left, but had not been seen in the neighborhood. I can say that my friend is very compassionate and virtuous, so I think the it was not a coincidence that the turtle chose her. One of the monks of the temple I worked at most of the days (Kodai-ji) has a turtle that is nearly as old as he is. He is still pretty young, though, around 32 years. The turtle is usually kept near our tool shed, but he flees sometimes to the big pond. However, since he never learnt to feed himself, one of the gardeners has to go catch it and bring it back to its water basin. Catching it is easy: Just waved a box of turtle food near the edge of the pond and the turtle will surface really fast. Comment of the monk: 「馬鹿だから。。。」”Because he’s really stupid”. I still laugh when I think of this episode. I found one great youtube channel during my research: Japan Antique Roadshow . This is the link to the episode about a bushy-tail turtle roof tile. I will watch more of their clips about Japanese antiques as they are very informative, yet short & sweet. The spring season special opening (春特別拝観) with extended hours and a beautiful light-up of the garden is ended yesterday at the last day of the official Golden Week. I experienced the garden today for the first time without visitors and was amazed by the atmosphere. Even the staff was gone while I did my last round of the day. 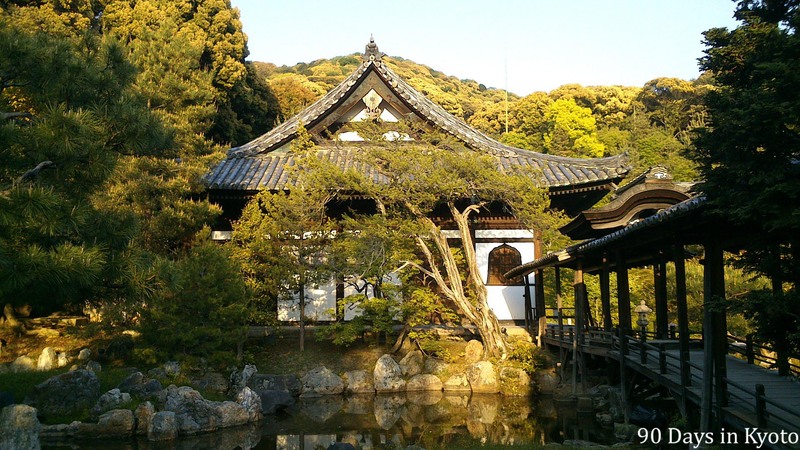 I was tired after some days of long long working hours and all I wanted to do is sit on the wooden veranda (engawa – 縁側) of the temple, enjoy the garden and fall asleep.